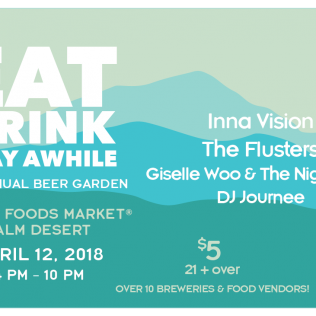 Palm Desert, CA – Whole Foods Market’s second annual Wholechella Beer Garden will be the only event of its kind during Coachella weekend, outside of the beer garden at Coachella Fest. The beer garden will welcome locals and visitors by offering a more relaxed atmosphere that places craft beer, food and live music at the forefront. Gracing the 2018 beer garden stage will be Hawaii-based reggae outfit, Inna Vision, hosted by 2016 Coachella performers The Flusters, valley favorite, Giselle Woo & The Night Owls and Stronghold Reggae’s DJ Journee on the turntables. Event patrons will be able to enjoy food from the Tap-In Taproom, the pop-up taqueria at the beer garden, as well as food and drinks from the following onsite vendors: Capello’s Pizza, Siete, Hangar 24, Sierra Nevada, Coronado, Thorn, Boochcraft, Uinta, Stone, BuzzBox and more. The Pre-Fest Beer Garden is a 21+ event. Whether you’re performing at Coachella and need to transport your gear, or you’re going with a group of friends, make sure to check out Avon Rents for the perfect vehicle!